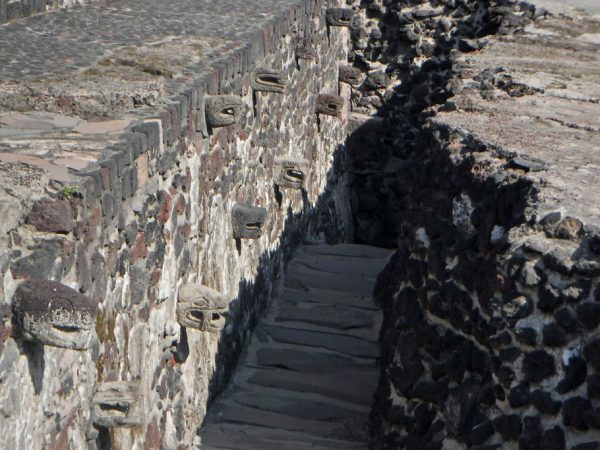 Looking down the Avenue of the Dead from the Pyramid of the Moon at Teotihuacán. January 2 – January 9, 2019. I’ve been feeling a bit jealous. In the US there were concerted efforts to erase the traces and culture of indigenous populations. Some of my ancestors may have been part of these efforts. But here in Mexico descendants of the peoples conquered by the Spaniards are surrounded by ancient sites built by their ancestors. Many of the sites are accessible, and many have excellent museums. Most of the ruins we have visited so far (Hu Tezza, Las Labradas, Ixtlán, Guachimontenes, and Ihuátzio) have been exciting to me because they represent a time of development. People here had already mastered the basics of tool building, agriculture, and astronomy. 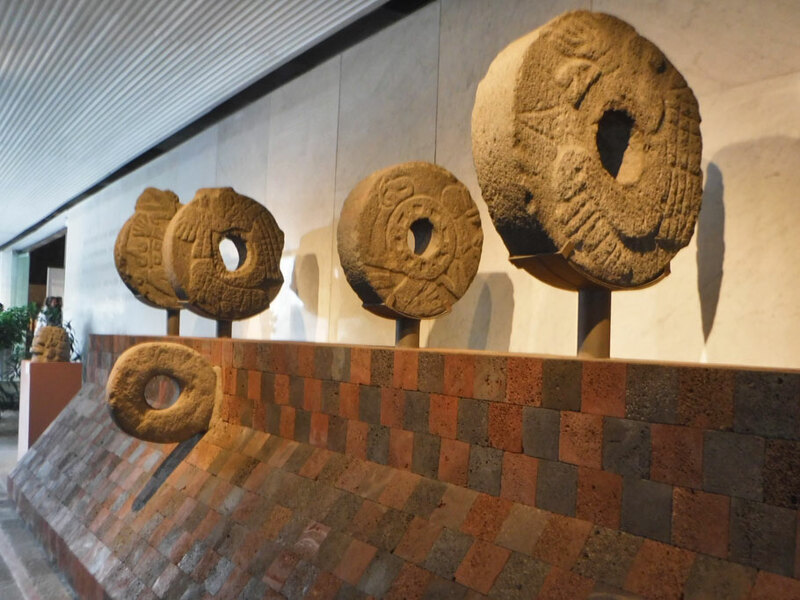 Now they were developing written languages, understanding the concept of zero, building monumental pyramids, and establishing local governments that served their societies — building civilization. The Museum of Anthropology we visited in Mexico City uses artifacts and displays to describe this era and those that follow. The Museo is full of information. Thankfully, only a fraction of it is translated into English, or I’d still be there reading. 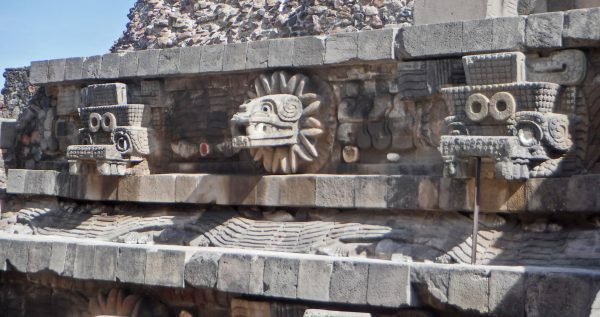 The Teotihuacán ruins near Mexico City are also pre-Aztec. But, now that I think about it, there is really no need to be jealous. While the various cultures were building civilization here, the same development was happening concurrently and independently all over the world. (Also followed by empire building.) It really amazes me that the development of such different cultures, separated geographically for at least ten thousand years, could be so similar. So, in a way, the ruins here also belong to me (and to all of us). 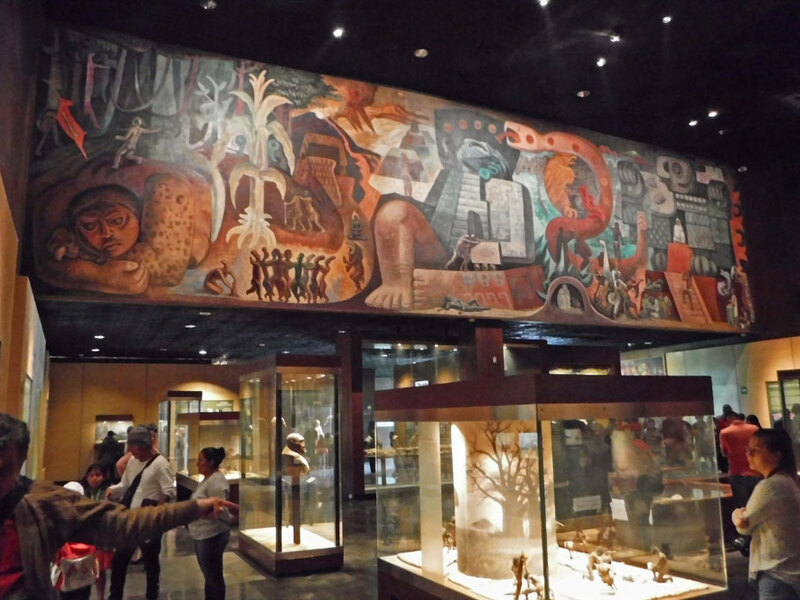 El Museo Nacional de Antropología was a fairly short trip up our Metro line. 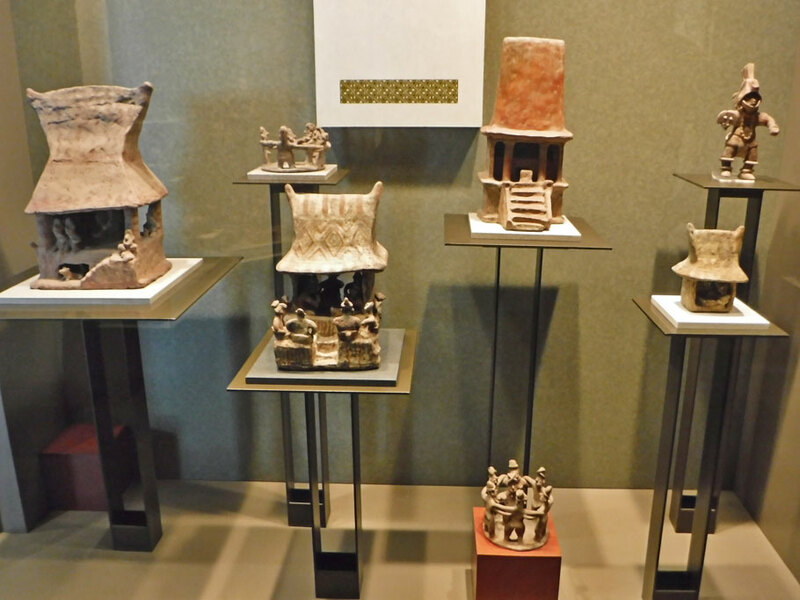 It is one of the museums in the huge Bosque (forest) de Chapútepec. Goals that were mounted on the sides of ulama courts. Ulama was the ball game played throughout Mesoamerica before and during Aztec rule. One of the objects was to knock a 9 lb. rubber ball through one of these holes using your hip. 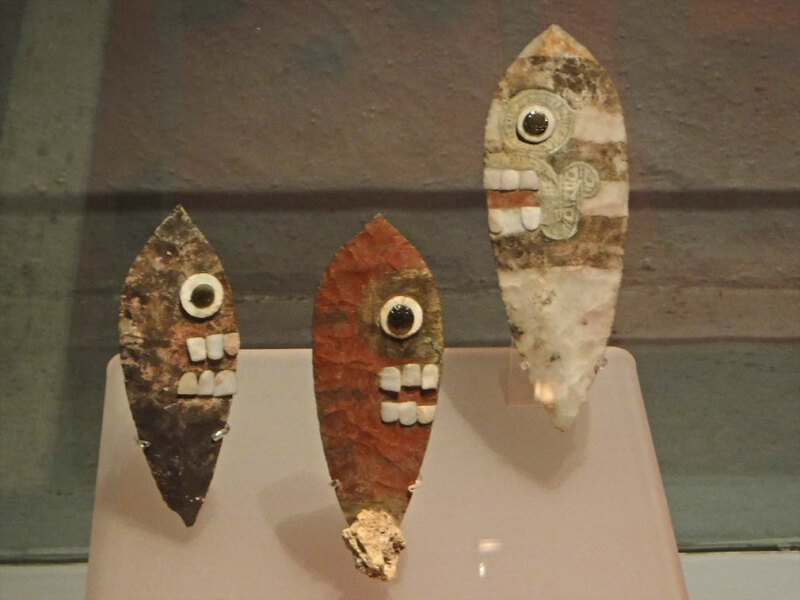 These ceramic dancing figurines are actually whistles made between 600-900 C.E. in Veracruz. 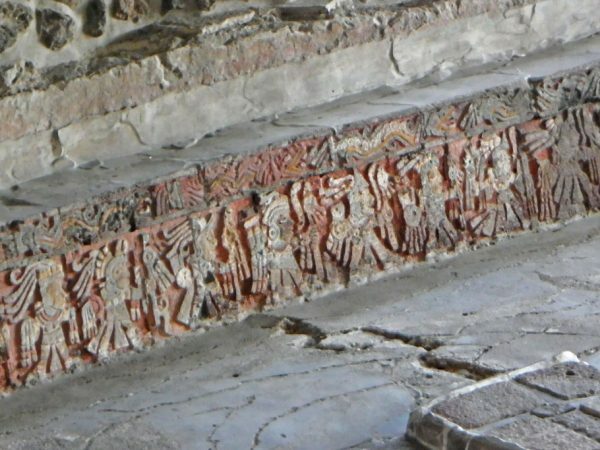 Scenes of daily life from Ixtlan (which we visited earlier). Wooden structures, some atop pyramids, had roofs as high as the structures themselves. These were made before 600 C.E. Replica of the Mayan Temple Hochob in the Yucatan, wich was built around 800 C.E. 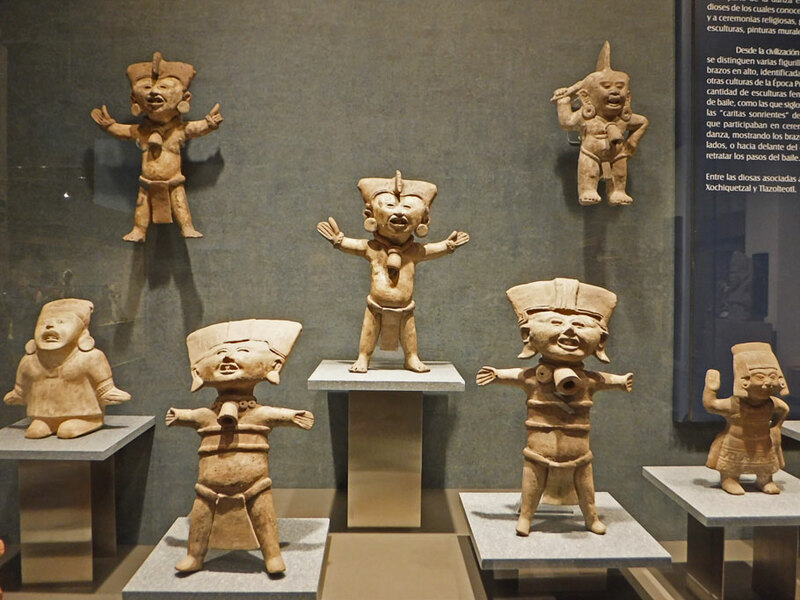 Humanity populates the Americas in the Anthropology Museum. When I was a kid I learned that humans crossed the Bering land bridge 10K years ago, after the thaw of the last Ice Age. Now that older relics have been found, it’s assumed they migrated over the frozen bridge. Maybe if a white guy (like Thor Heyerdahl) crossed on a hand-made raft, the land-bridge requirement would drop. Courtyard in the Anthropology Museum, where it always rains under the concrete umbrella (paraguas). 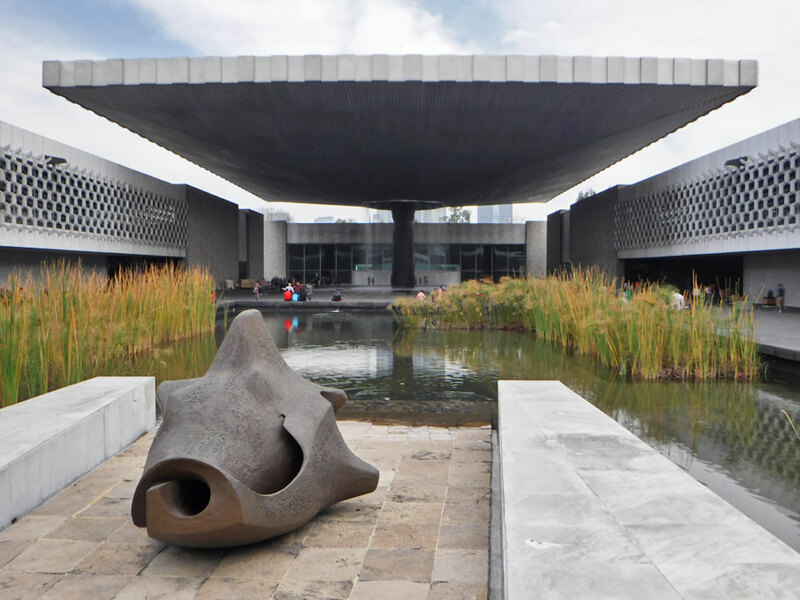 The umbrella’s single support is a column with a bronze surface carved by the Chavez Morado brothers. A fountain rains water around the column. Although it describes the passage of time, the Aztec Sun Stone wasn’t meant to be a calendar. Made of olivine basalt the 20 ton stone was transported by human labor, carved just before the Spanish arrived, then buried. Unearthed over 200 years later it became controversial. If they study this will people quit believing that humanity was destroyed by flood 6K years ago and start believing that the blood thirsty sun god killed off humans thrice, turning them into monkeys, then turkeys, then fish? We won’t make it as far east as Palenque this trip. 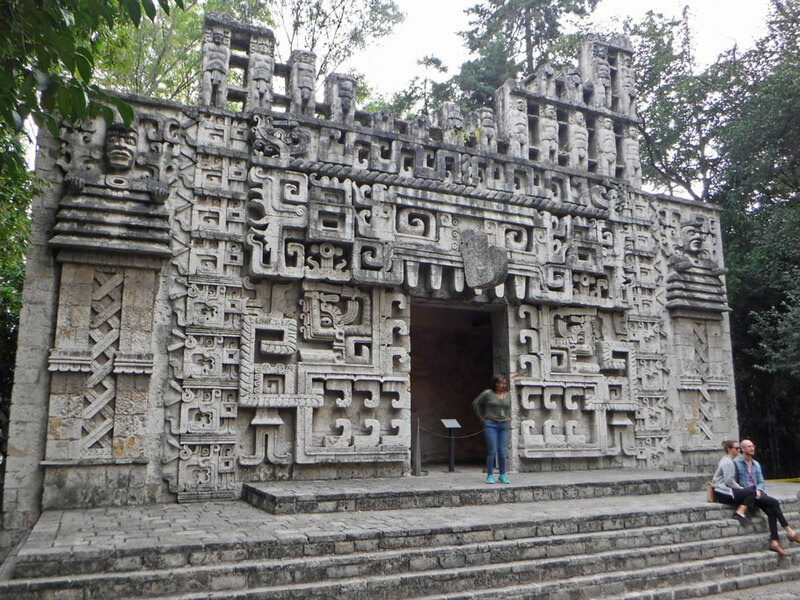 But here is a recreation of Pakal’s tomb from that site. 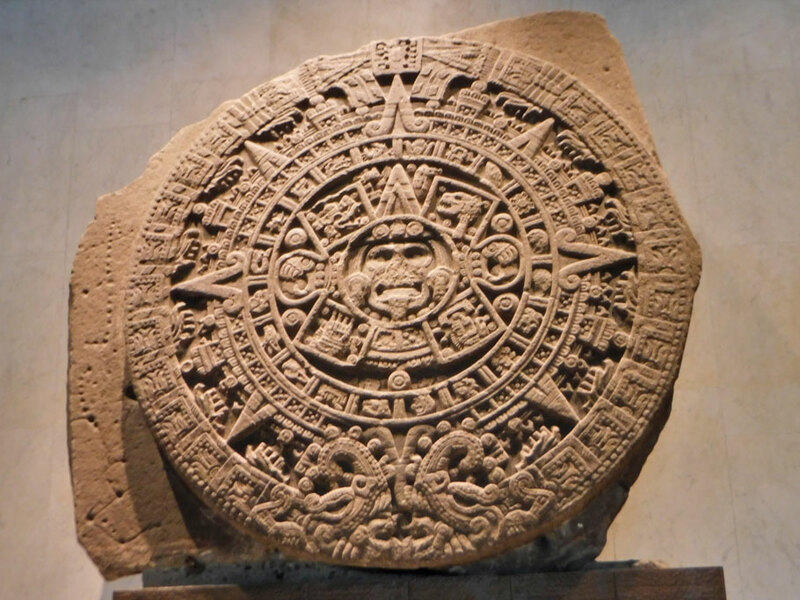 Pakal ruled for 68 years in the 7th century. He was buried in a jade mask and jewelry which are on display here. Teotihuacán was a little harder for us to reach. We set alarms and rode the Metro, making two changes, to the Autobuses del Norte stop. From there we took an hour-long bus ride to the ruins. View in the Teotihuacán complex. We are walking up the Avenue of the Dead toward the Pyramid of the Moon. At its peak, around 450 C.E., the city here supported 125K people. Courtyard in the Palace of Quetzal-Papalotl. Friezes on the columns are partially restored. 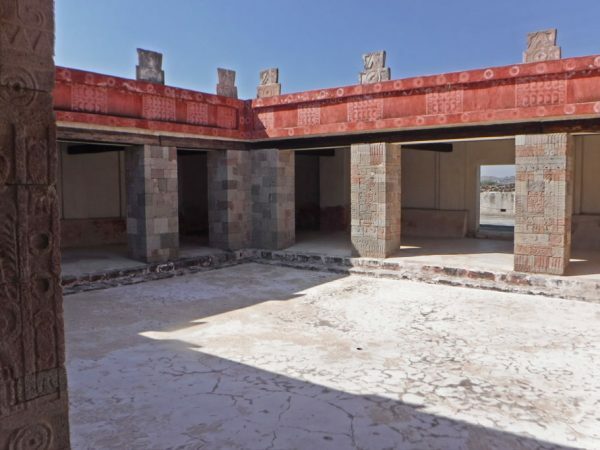 Shadows from the stelae above the roofline marked time and seasons. 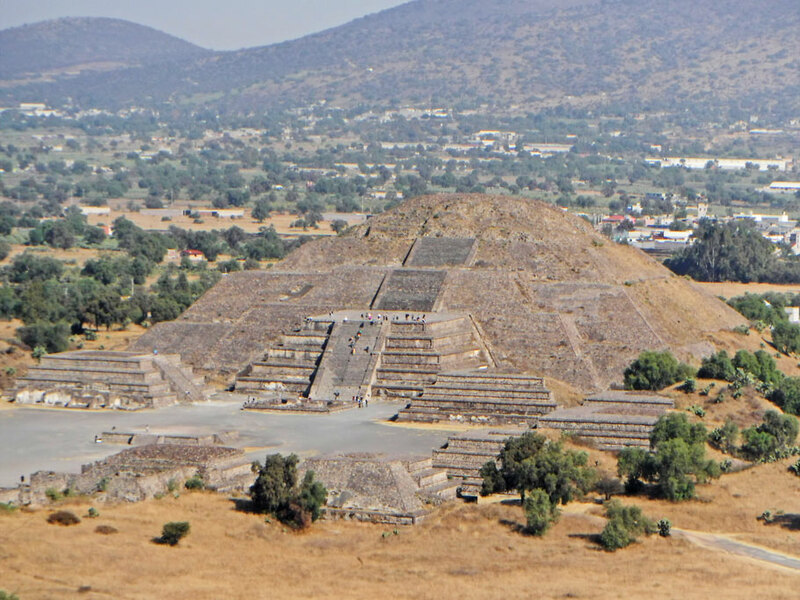 View of the Pyramid of the Moon from atop the Pyramid of the Sun. 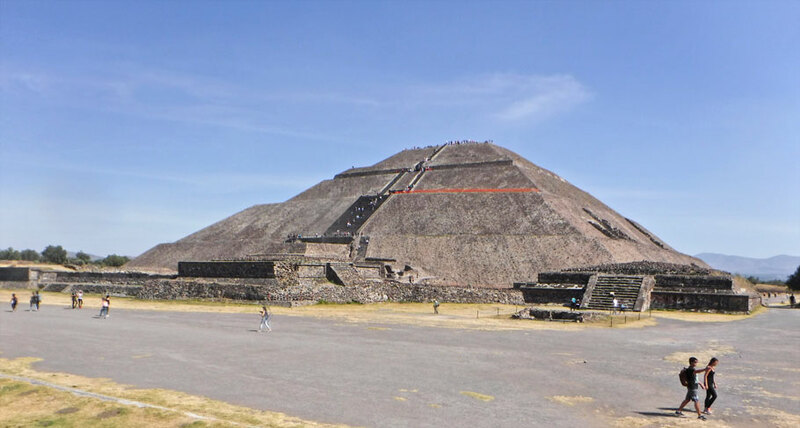 The Pyramid of the Sun, third largest pyramid in the world, was completed around 200 C.E. Underneath it is a tunnel which may have been used for tombs. Feathered Water Serpents and stylized earth monsters at the Temple of Quetzalcoatl. More serpents and earth monsters. 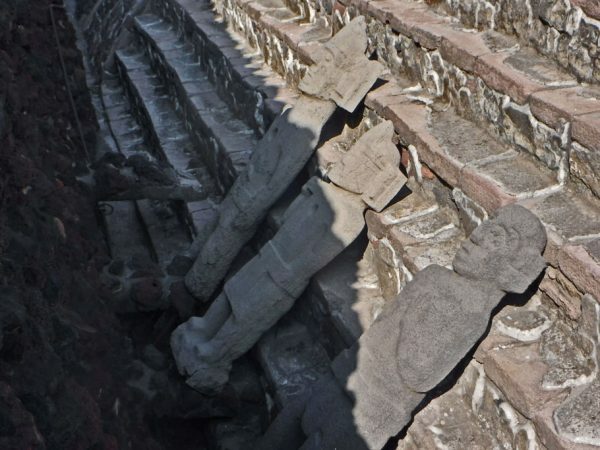 Teotihuacan collapsed around 550 C.E. Perhaps a recent volcano eruption or droughts contributed. There is some evidence that the “have-nots” burnt up the homes of the “haves”. View of the Pyramid of the Sun from the Pyramid of the Moon. The small enclosed village of Tetitla is a short walk from the main Teotihuacán complex. 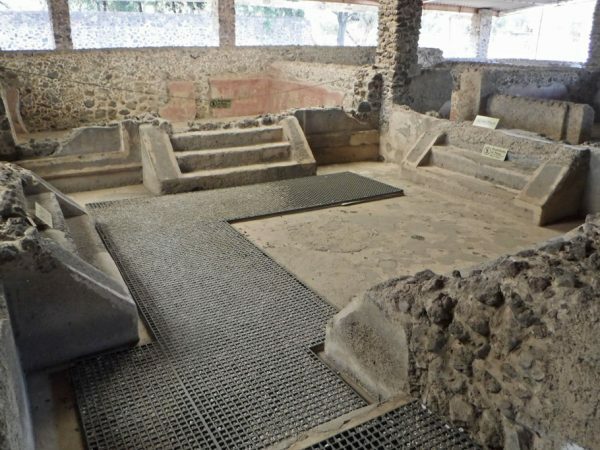 Initially three small abodes, the homes were joined into a complex which housed 100 people. 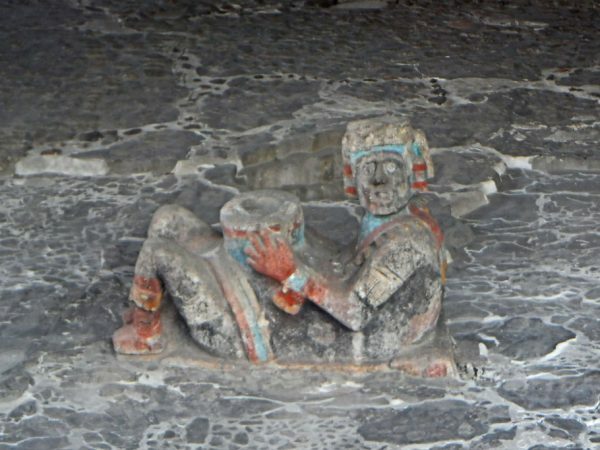 Patios had central drains and altars, and were decorated with paintings of jaguars, bloody beaked falcons, and a conch diver. Mural of repeating motif at Tetitla. Figure is a diety with a jade mask, and elaborate head-dress. Jade objects fall from his hands. 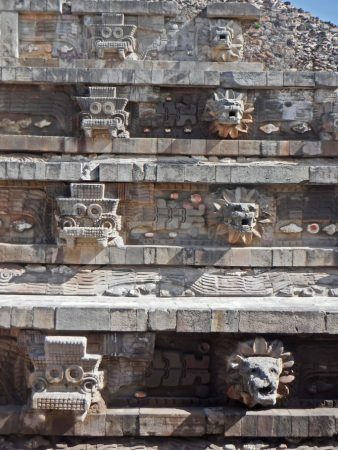 Mural of cats with feathered head-dresses at Tetitla. Many of our readers will be delighted to know that cats were worshipped here. El Templo Mayor is in the El Centro historic part of Mexico City, near the Zócalo. We rode the Metro to this area a few times. 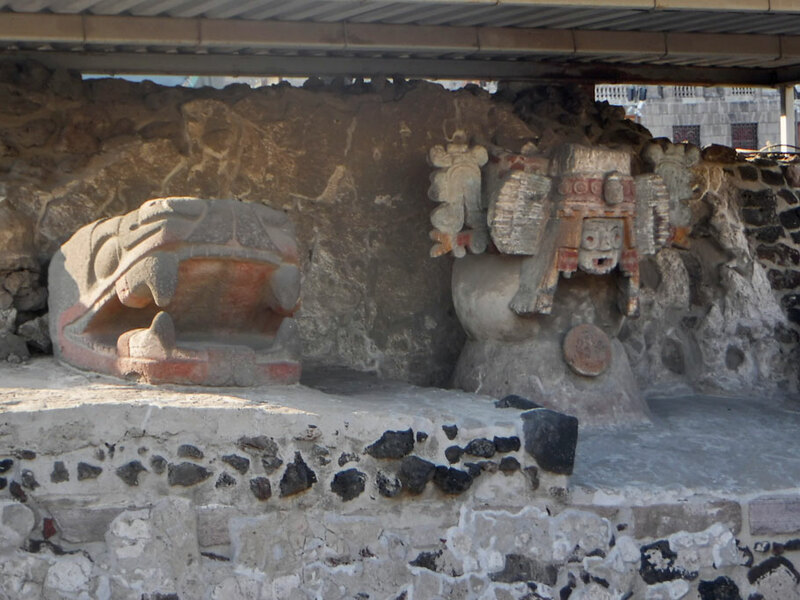 The Aztecs originally built the Templo Mayor pyramid early in the 14th century. 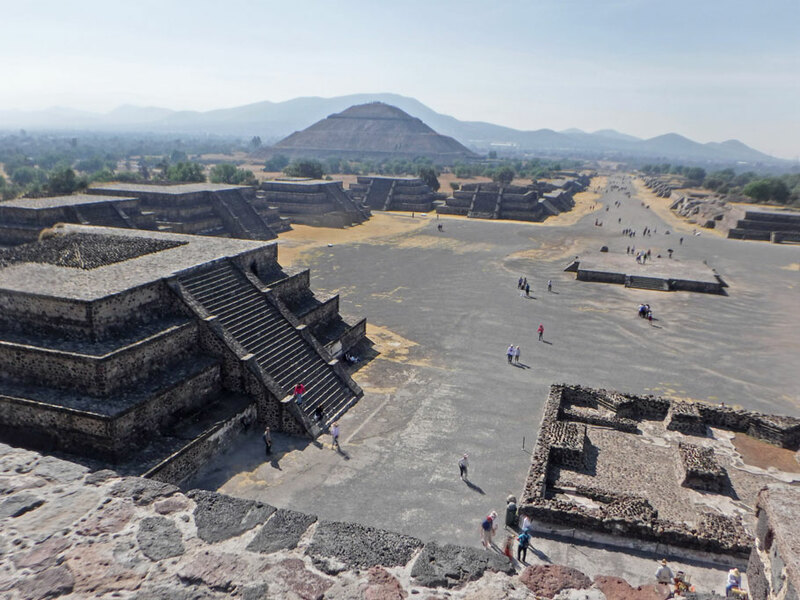 Prior to the Spanish conquest, new pyramids were built over their predecessors six more times. The new Spanish empire used much of the stone on buildings of their own. At one point the complex was a land fill. Excavation didn’t start in earnest until 1978. Now visitors can walk ‘through’ parts of each building stage. 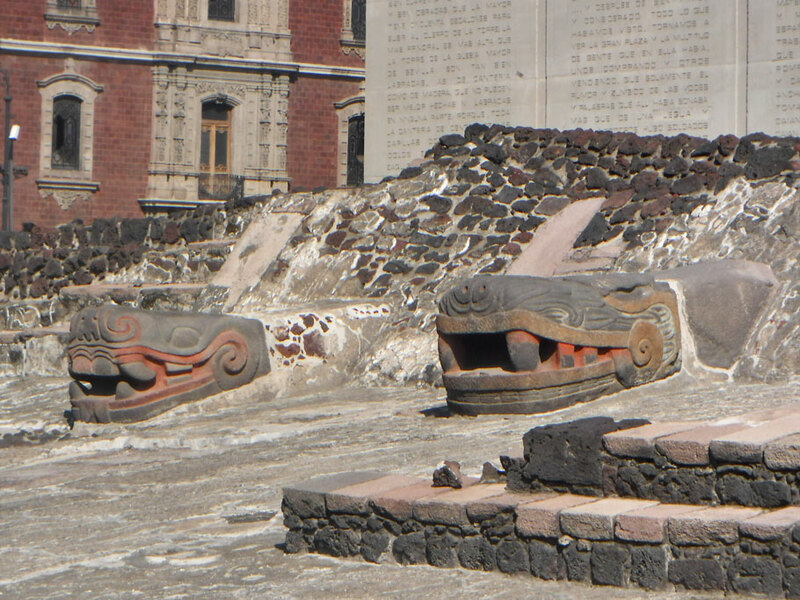 Snake heads at the Templo Mayor. Before building the next temple, these statues were left outside the prior temple, possibly as offerings. Painted figure of Tlaloc, the rain god. 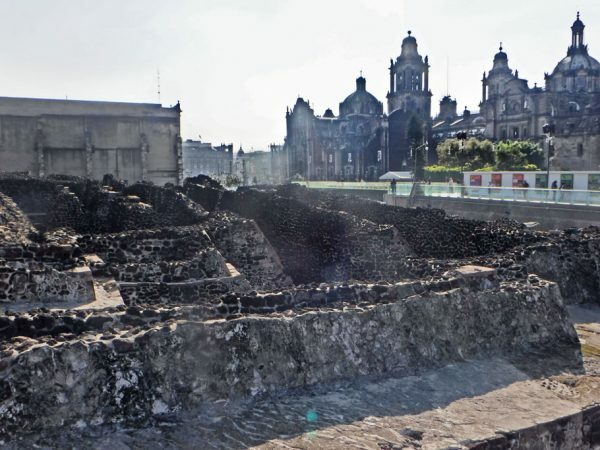 Exposed ruins of the temple with newer El Centro buildings in the background. 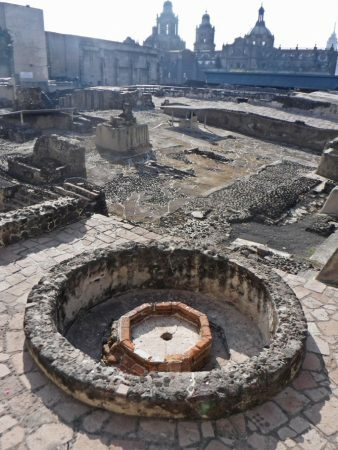 Several buildings around the temple pyramid have been excavated. Here is an altar. Frieze inside the House of Eagles shows elite eagle warriors in a procession. They are on their way to sacrifice some of their blood as offerings. 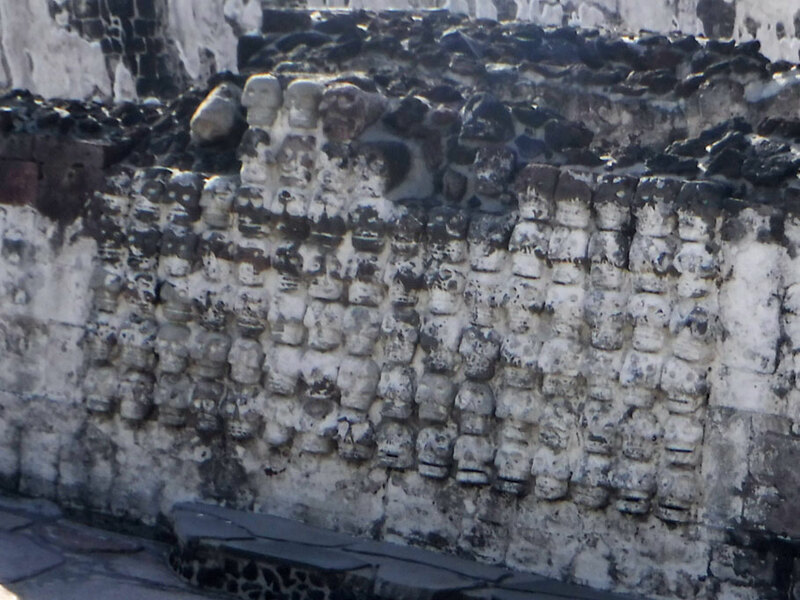 One building in the complex was decorated with an exterior wall of skulls. Offerings inside included a collection of musical instruments and two wolf skeletons. Serpent head on the left and rain god Tlaloc on the right. The sides of his headpiece are clouds. 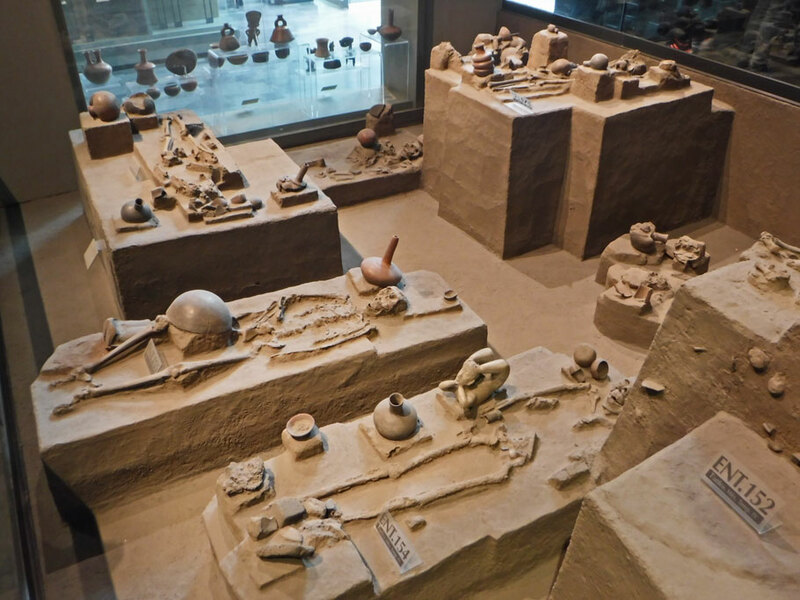 The museum of the Templo Mayor contains over 7K artifacts which were excavated from the site. The Aztecs collected and preserved everything: artifacts from surrounding cultures, tools used in all trades, samples of plant and animal life, and totems such as these flint arrowheads decorated as people. 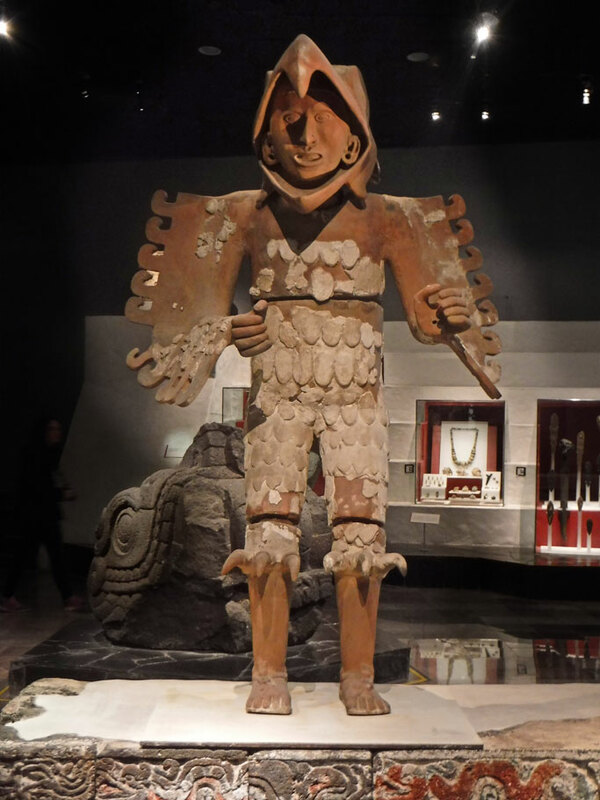 Sculpture of an Eagle Warrior found at the Templo Mayor. This entry was posted in Mexico, Mexico City, Travel On The Dirt and tagged Mexico, Mexico City, Museum of Anthropology, Native American Ruins, Ruins, Templo Mayor, Teotihuacán. Bookmark the permalink. Beautiful. 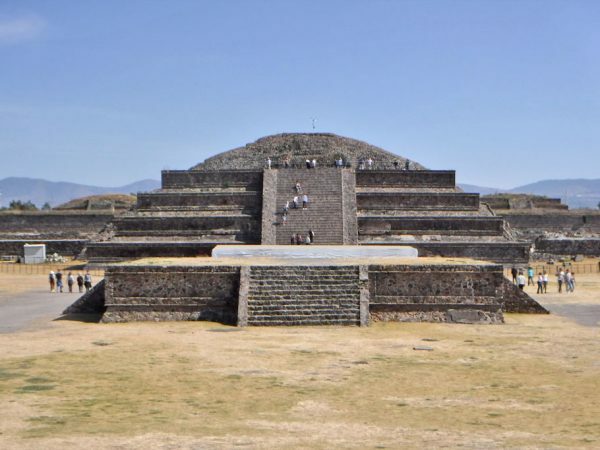 A visit to these pyramids in Mexico, will reveal so many things about the people of ancient civilization to you. Yes, visiting places where ancient civilizations lived is always enlightening. Thank you for sharing your adventures. The photos and information are wonderful. You make e feel like I am making the trip with you. So enjoy what you are doing! Thank you Brenda! As long as you keep following along we will continue to share the adventure!